We’re getting closer to a world where cars are able to drive themselves, and 2017 marked a huge year for autonomous vehicles. Self-driving cars racked up millions of miles on public roads with very few incidents. Many of the technologies that have been developed along the way, such as adaptive cruise control, advanced braking, lane departure warnings, and collision avoidance systems, have already been implemented in vehicles available to the public. Despite these advances, the future of fully autonomous vehicles without a human behind the wheel is still a long way away, and there are still many challenges that need to be solved. One of the biggest is ensuring that cars have consistent, reliable, and uninterrupted access to high speed wireless networks. 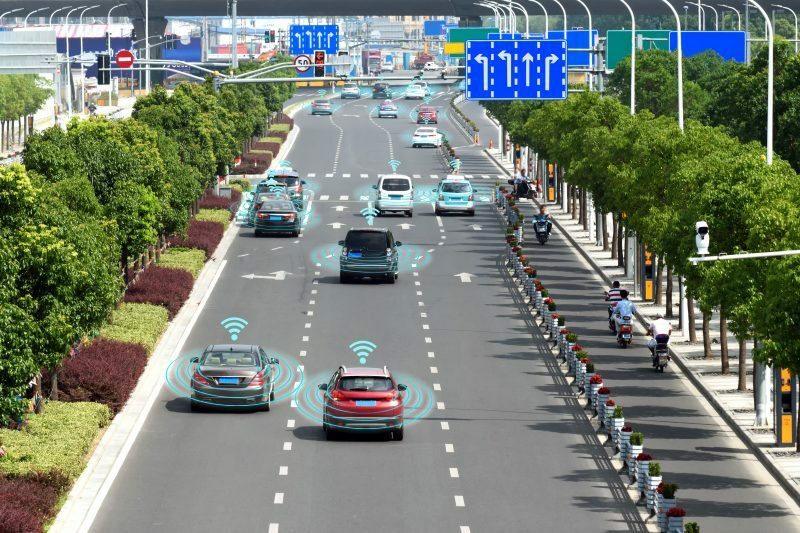 Advances in 5G technologies and dedicated short range communications (DSRC) will address many of these concerns, but until these connectivity issues are solved, truly autonomous vehicles will not be possible. Two factors in particular will pose the biggest challenges to researchers – network performance and interference. Intel estimates that a single self-driving car will require more than 4,000 GB of data per day. By 2020, that’s the equivalent of 3,000 people’s average data use. All that data will come from the cameras, radar, sonar, GPS, and lidar systems that are essential to keeping the car on the road. What’s more, these systems need to be able to communicate with each other, with surrounding vehicles and infrastructure, and with centralized data centers. But that’s only one car. Scale that up to a city’s worth and the amount of data required soars. Today’s networks are simply incapable of providing the bandwidth required for self-driving cars on a large scale. Another big challenge for these vehicles is latency. On today’s 4G networks, a vehicle travelling at highway speeds moves about 4.6 feet from the time an obstacle is seen to the time the braking command is executed. That delay could mean the difference between safely avoiding an obstacle and a collision. Finally, the number of devices connecting to the network will be far greater than anything we have today. Not only will the cars themselves be connected, but much of the safety infrastructure will be as well. Everything from stop lights to traffic cones will be transmitting and receiving data at all times. And that’s not to mention the people riding in the cars, who will no longer have to focus on the road and can comfortably use their devices for all sorts of activities. With so many devices transmitting at any given time, interference will become one of the greatest challenges for self-driving cars to navigate. Inadvertent interference, from other cars or nearby devices for example, could lead to issues transmitting and receiving data. An even greater risk would be intentional or malicious interference intended to disrupt the vehicle’s communication systems. You already experience interference in less consequential forms. Whenever your Netflix stream slows to a crawl, or your call drops on your smartphone, the likely cause is interference. While these examples are annoying and inconvenient, interference can become deadly when you’re dealing with cars. Imagine a car is travelling through an intersection and loses communication with the vehicles around it. The car would be essentially blind to its surroundings, and without proper backup systems in place, the result could easily be an accident. To overcome these challenges, multiple types of networks and signals will likely be deployed and used. For example, DSRC could be used to communicate with other vehicles and infrastructure in the car’s immediate area. Cars could even form groups that travel together and share information on speed, braking, and road conditions. Early on, these groups will likely be introduced on highways where there is more visibility and less chance of unexpected incidents. Looking ahead, this type of communication could one day remove the need for traffic lights entirely, as vehicles coordinate amongst themselves the best and most efficient way through intersections. 5G wireless technologies could then play a critical role enabling more centralized communications. Cars could use 5G networks to pick up data on road conditions, traffic patterns, and other information. Leveraging machine learning and artificial intelligence, data collected by one vehicle could be shared back to a centralized data base and then sent to other cars through updates, improving their ability to react and respond appropriately to any situation. 5G also has a big advantage when it comes to latency. At highway speeds, a vehicle connected to a 5G network would travel only 1.1 inches before the braking command is applied, compared to the 4.6 feet on 4G. This difference represents a huge safety improvement. 5G will be the first technology that will be able to handle the bandwidth requirements of self-driving cars. But we’re still a few years away from 5G being widely and commercially available. No matter what solutions eventually win out, one thing for sure is that we have a long way to go before we completely replace human drivers. Spectrum challenges are only just now being considered, and the technologies that will support self-driving cars are still being developed. In order to achieve the future of ubiquitous, fully autonomous roadways, we’ll need to overcome the challenges of reliable spectrum access and network performance. But once we do, self-driving cars will change the way we get around forever.